Corundum (Ruby & Sapphire), Beryl (Emerald & Aquamarine), Pyrope-Almandine (Red Garnet), Blue Topaz, Natural Quartz (Amethyst, Citrine, Smoky, Rose, Rutilated, Clear Crystal), Black Tourmaline, and Laboradite (facet cut). Our online Jewelry Showcase also offers a large selection of fine jewelry and accessories. *NOTE: Gemstones on our Jeweler Showcase link are not mined by us. Please contact us for our gemstone inventory. As a special “Triple Crown” Promotion, 100% of proceeds from ALL sales go directly to LSHR! Why buy from the mall when you can get the same product at a better price for a charitable cause?! It’s a call to the post and we are ready to mount! Post and mount your one-of-a-kind gemstone into a luxury jewelry setting that is! “Finish Line Gems & Jewelry” is a licensed jewelry retailer founded by children as a way to support Last Stop Horse Rescue, a 501(c)3 charitable organization, fund the cost of ensuring the horses we rescue are provided the best care possible. Kenny and Kimberly (ages 9 & 3) were at the starting gate of an outdoor hobby when trumpets began to sound. 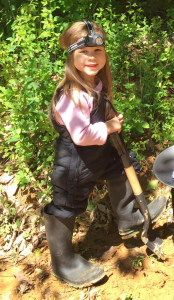 And they were off- prospecting for gold and gems! 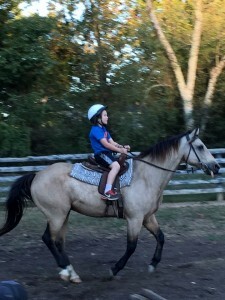 It was “A Run for the Roses” as the children came up with an idea to help their Grandmommy’s horse rescue. So with their mother’s shared excitement, “Finish Line Gems & Jewelry” was established. Finish Line Gems & Jewelry finds stones native to North Carolina and the Georgia Mountains in their natural rock form and then sends them to a local gem cutter where they are transformed into beautifully faceted gemstones. Approaching the finish line- and guaranteed to be a maiden win– the gemstones are then sent to the Gemology Institute of America (GIA) for certified lab reports in preparation for the Winners Circle of Jewelry. Gemstones can be purchased as certified loose stones or in finished settings- all set in 14K solid gold (unless otherwise specified or requested). You may also have your jewelry custom designed- and we will gladly help you create a unique, one-of-a-kind piece! Finish Line Gems & Jewelry understands jewelry often holds priceless sentimental value, so if you already have your own setting- maybe your grandmother’s ring or your mother’s pendant- and would like to add a natural gemstone with a special story and purpose, we would love the opportunity to take part in creating your cherished heirloom. So what makes Finish Line Gems & Jewelry the front runner of natural gemstone jewelry? We are a licensed jewelry retailer, all of our gems are prospected by our family and can be cut to order, they are all certified as natural gemstones by the GIA, and the best part is…The moment your “pick” crosses the finish line, 100% of the proceeds go directly to benefit Last Stop Horse Rescue (LSHR)! 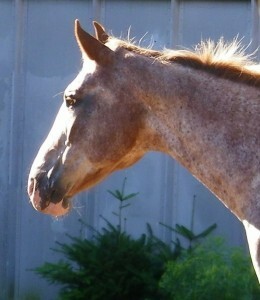 LSHR was established in 2005, but one horse in particular was the reason we became licensed in 2011. 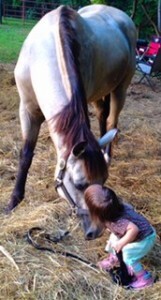 This horse was 1 of only 4 surviving horses seized by the State of Maine. It was a heartbreaking situation. We had rescued many horses in the past, but this horse was our first rescue where our efforts were needed by State Animal Welfare in order to save her innocent, helpless life. She deserved to live…she deserved to be loved… SHE was perfect! And her name just happened to be Royal Gemstone. We believe in “signs” and it was no coincidence when Royal Gemstone’s picture spontaneously appeared on Toni’s computer desktop as she was ordering her mother Joyce’s Christmas gift…a Mother’s Ring with gemstones found by Joyce’s grandchildren. Seeing Royal Gemstone’s picture is what gave Toni reassurance that she and her children’s idea to create a gemstone jewelry brand for Grandmommy’s horse rescue would be a success! The start of Finish Line Gems & Jewelry! 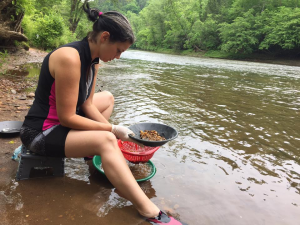 Here are Joyce’s grandchildren panning for gold and gems to help raise money for LSHR! Thank you, Kenny & Kimberly, for working so hard to help the horses! Mother and Grandmommy are so proud of you; we love you so very much! This was Joyce’s Christmas gift from her daughter Toni. Toni and her beloved Grandma Ginger’s birthstones, Aquamarine and Sapphire, were found in their natural rock then cut into beautifully faceted gemstones and placed into a very special setting chosen together. Unless otherwise specified, all of our gems are GIA certified and will come with a lab report. We currently have several orders in production, designs in the making as well as more gold to pan and gems to mine! NOTE: Our online Jewelry store to benefit LSHR is on its way! See more of our items on eBay for Charity; And you too can donate to LSHR through eBay! Last Stop Horse Rescue believes PATCH will be the horse to “patch-up” people’s beliefs that the life of a horse matters regardless of any imperfection in appearance or physical limitation they may have! As a licensed equine rescue in Maine and Georgia, we have come across an array of different circumstances in which horses have found their way into our hearts as part of our “rescue family” and rehabilitation program throughout our 12 years of operation. Sadly, many horses have come to us with histories of abuse, others were seized by the state under severe cases of neglect, and then there were those who were just simply “unwanted”- unwanted because perhaps like Patch, they too were missing an eye. the show world.” Let’s just say, I am SO GLAD Pierogi lost his show-worthy smile (according to his prior owner) because I loved him unconditionally from the moment we met and nothing was going to stop me from bringing my boy home! Tongue out and all, Pierogi is beyond perfect. My young children ride him and he keeps them safe. He is also a wonderful friend to the other horses at the rescue and loves listening to Frank Sinatra! I pray true stories like these will help prevent future cases of unwanted horses- especially for unfair (cosmetic) reasons! Patch’s story is even better though because it delivers a message of hope and inspiration. Whether you’re a fan of the Triple Crown races or not, it doesn’t change the fact that horse racing is one of the oldest sports in history and only the best of the best equine athletes are even eligible for a one time chance to even enter! The Triple Crown begins with the Kentucky Derby, 2 weeks later is the Preakness, and then it ends with the Belmont Stakes, also known as “The Test of The Champion!” The 3 jewels that make up the Triple Crown are strictly for 3 year old Thoroughbreds- and they’re only 3 once! Many people associate horse racing with gambling, well some may think that would be a pretty big “gamble” to run a one-eyed horse in such a high stakes race! But for Patch’s owners and trainer it wasn’t a “gamble” at all. Horse racing aside, this is a perfect example of the importance of never giving up on a life you made a commitment to. It is a lesson that anything is possible as long as you BELIEVE. Patch’s humans believed in him so much so that they know he has what it takes to be a Triple Crown contender, which means they believe he is a champion! You don’t have to be a racing fan or follower to know THAT IS AMAZING!!! Run for the Roses, Patch! Show the world that having 1 eye, doesn’t mean you can’t win 3 races! And when the time comes for you to cross your final finish line, please know that Last Stop Horse Rescue’s gates are always open to welcome you as part of our family for lifelong sanctuary and a retirement full of love, care, and treats.